Assemblance is an innovative new art installation in London, UK, where interactive laser technology crosses with arts and the humanities, to create a stunning visual experience. ORLANDO, Fla. - July 25, 2014 - PRLog -- Pangolin Laser Systems, Inc. today announced, that they have partnered with Umbrellium (a world-leading team or arhcitects, designers, commerical experts and technical artists) to create an Interactive Laser Display, that pushes the boundaries of art, entertainment, interactivity and laser safety, creating a touring installation that that incorporates laser-entertainment technology, in a way never done before. Interactive Entertainment Displays are becoming increasingly popular across a wide-variety applications, and a large number of lighting designers, artists, and project managers are turning to lasers as the light-source of choice, to bring their creative ideas to life. One note-worthy Interactive Entertainment Display that has drawn a lot of media attention, is Assemblance; an immersive laser experience by artists Usman Haque and Dot Samsen who are known for their large-scale mass participatory interactive events. This immersive experience takes over “The Pit”, a blackened room filled with three-dimensional laser-light fields inside of the Barbican Centre (London, UK). Here, visitors are able to shape, manipulate, and walk through these laser-light fields, wrapping themselves in blankets of light creating delicate 3D luminous forms in space, accompanied and encouraged by sound, which follows each gentle move. Like building sand castles on the beach, Assemblance explores how to structure participation in order to build trust between people, who must sometimes suspend disbelief in order to cooperate and co-exist. The space, at times magical, at times slightly sinister, creates deep emotional engagement by blurring arbitrary distinctions between physical and virtual. “At Umbrellium we have become known for our large outdoor interactive installations which engage the public in unusual ways in urban spaces,” says Usman Haque, Umbrellium, “so it has been a fascinating and new challenge for us to design similarly engaging experiences indoors, at a finer scale. We are excited by Assemblance, our installation for the Barbican’s Digital Revolution exhibition, and look forward to witnessing how people manipulate and shape the light around them and to seeing how they collaborate with one another or otherwise in the depths of the Barbican's Pit Theatre. 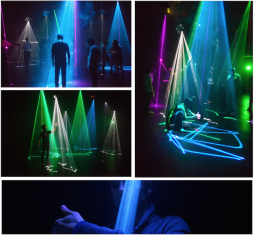 What makes this art installation so incredible for those in the lighting and entertainment industry, is that it is the first time audience scanning (an effect where laser beams are intentionally projected at those in an audience area, or onto a performer themselves) has been used in a public art installation, allowing for people to actually interact with, touch, and experience the effect first hand. The technologies used to create a laser display of this caliber, and to ensure it’s safety, are also cutting-edge, and laser-entertainment industry leaders Pangolin Laser Systems, Inc. and KVANT s.r.o. were proud to have been sponsors of of the installation. Pangolin worked hand-in-hand with KVANT, to integrate their patented, award-winning PASS hardware (Professional Audience Safety System) into KVANT’s new ATOM “pure-diode” laser projection systems, for use at Assemblance. Pangolin’s PASS hardware is an all-encompassing laser safety system, that can ensure audience scanning effects are safe for those viewing. It’s received several international patents and awards, and is currently the standard in the United States and UK (where audience scanning is heavily regulated by government safety agencies), for those who wish to perform audience scanning laser effects. KVANT is one of the only companies in the world, certified to integrate PASS hardware into their laser projectors. For laser control, Pangolin’s LD2000/BEYOND software and QM2000.NET hardware was utilized, providing the artists with complete creative reign, in programming the desired laser effects. Umbrellium’s Assemblance forms part of the Barbican’s Digital Revolution, an immersive and interactive exhibition, which brings together for the first time a range of artists, filmmakers, architects, designers, musicians and game developers, all pushing the boundaries of their fields using digital media. It also looks at the dynamic developments in the areas of creative coding and DIY culture and the exciting creative possibilities offered by augmented reality, artificial intelligence, wearable technologies, laser displays, and 3-D printing. Assemblance will sit alongside new commissions including Google's DevArt, an installation by global music artist and entrepreneur will.i.am and artist Yuri Suzuki and works by Universal Everything, Seeper and Susan Kare (Mac Paint designer). Visitors will also see work by Oscar-winning VFX Supervisor Paul Franklin and his team at Double Negative for Christopher Nolan’s groundbreaking film Inception; artists and performers including Rafael Lozano-Hemmer, Chris Milk, Aaron Koblin, Fred Deakin & Company, Amon Tobin and Philip Glass and game developers such as Harmonix Music Systems (Dance Central). About Pangolin Laser Systems, Inc. Since 1986, Pangolin has amassed over 30,000 clients in 63 countries firmly positioning themselves as the world leader; providing software and hardware solutions to the laser light show and entertainment industries. For more information on Pangolin and their award winning line of products, visit their website at http://www.Pangolin.com. You can also find them on Facebook at http://www.facebook.com/PangolinSystems. : Justin Perry, Pangolin Laser Systems, Inc.